BMRT, originally BMR's Tilesets, has branched out into providing more than just ready-to-import tilesets. I have now divided the project into three, BMRT (the original), BMRFT (floor tiles), and BMRWT (wall tiles). I realize that not all game makers will want ready-made tilesets that they can import. Some of what's on a tileset may be irrelevant, there might be a need to mix-and-match, etc... To that end, I've created two new sections of BMRT which provide floor tiles and wall tiles exclusively. Thesre are saved as PNGs and will require some editing to fit whatever palette is being used, but such shouldn't (in theory) be too much work. As of June 16, 2013, BMRT is in the public domain and not Creative Commons. That means you can use it commercially, privately, intergalactically, or whatever without need to ask me for permission. You don't even need to credit me or to pay me any earnings from anything you make. Although I can't stop you, I'd like to ask that the tiles not be sold as-is in an art pack. They're being distributed here for free, so if you want to sell the pack, try to add something else to it. But like I said, as it's in the public domain, technically, there's nothing I can do about it. Either way, I prefer to look on the bright side and believe in the inherent goodness of people. Have fun with the tiles, and happy game making! 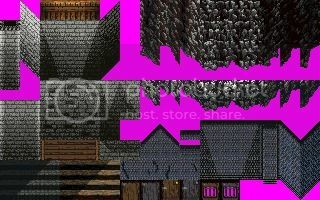 BMRT is a collection of different tilesets that can be used with the OHRRPGCE (or pretty much any engine I suppose). 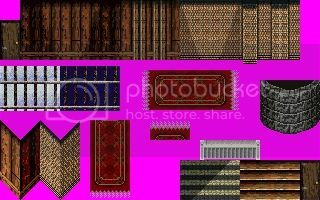 There are a variety of different tilesets included, and I plan on adding more with every new version. These can readily be imported into Custom with no editing. Take note though, that these use my Legacy palette and not Neo's Better Palette. In the future, I'll make one that conforms to Neo's, but that's still a ways off. This is a collection of different floor tiles. They each follow a set pattern of shading and lighting, so it should be easy to organize them. More details in the readme. Like BMRFT, these are PNGs. Unlike previos versions, these use my own custom palette, so it's up to the individual game maker to tweak the art before including such in a tileset for a game. Also like BMRFT, these all follow a specific pattern so again merging walls and placing them should be easy. Starting with version 3, these tiles are no in the public domain and can be used wherever, however, and for whatever purposes without attribution, permission, or anything similar. Have fun with them! 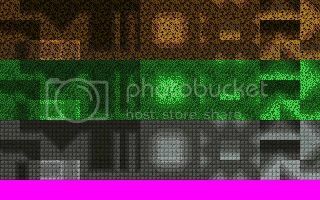 Over fifty different wall sets have been added with this update. The majority of these are moss-covered variants of previous walls, along with different ceiling and floor decorations. There are, of course, some bran new sets, like cages and fenced walls. I've recently been working on cabins in my game, so there are a few foresty, cabiny type walls in this set. This is an XCF file so to use it, you'll need to download and install the GIMP. The way it works is that each npc is cut up into different parts, e.g. hair, hair embellishments, tops, bottoms, shoes, accessories, etc... Each is on a different layer, so it's possible to achieve different combinations and looks for npcs. Take note though, that these do not conform to any palette at all. Furthermore, the resultant npcs sheets (copy merged to a new image) will most probably exceed the 16 color limit. This is not intended to be able to produce final versions of npcs, but rather it aims to provide an easy way to make npc bases from which to work off of. These are all free to use in whatever project you want. Further details are included in the Readme. This is a collection of various floor tiles. They are saved as PNGs and will require some work before importing into Custom. This is a set of various wall tiles. They are saved as PNGs and will thus need to be edited before importing into Custom. This is an XCF file that allows you to mix and match different parts of an npc to create walkabouts, interactions, and battle sprites. This is a compilation of ready-to-import tilesets. They are organized into different folders based on their theme. No reviews. Be the first to review BMR's Art Resources!